This site is free to enter, except for the Visitors Centre itself, which charges an entrSr fee. Designated parking spaces for Orange Badge holders are on offer. Entrance to the site is via steps from Tramway Walk, and a fully accessible sloped area from the car park. A small shop selling snacks has a stepped entrance and a side window. The entrance to the Visitors Centre houses toilet facilities which are fully accessible. Flat, level wooden floors feature throughout all the building, and exhibits and their operation controls are displayed at a low level. There is a low counter in the gift shop. Two steps lead to the outside. Those not able to use the steps should make themselves known to staff, who will be pleased to direct visitors towards an alternative sloped exit. Movement to upper levels of the Visitors Centre is via wide wooden staircases, with handrails to both sides. Otherwise, a lift, which is clearly signed, provides access. The lift has Braille operation controls. There is ample space for circulation throughout the centre, however, space can become restricted, as this attraction is often busy. On entering the tea shop there is a slight lip, the interior is flat and level. Fully accessible toilets are again provided. Visitors should be aware of the dim lighting which features, as they enter the Camera Obscura room on the first floor, and the Attic room on the second floor. 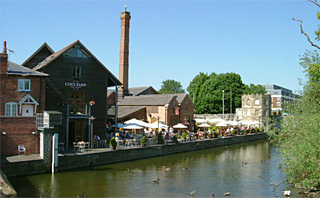 Cox's Yard is a popular destination venue in Stratford-upon-Avon. It is set around a converted timber yard on the River Avon and hosts a newly refurbished Family Pub and River Patio, Music Venue, Attic Theatre, Tea Room and Riverside Coffee Shop.